After spending a lot of time looking at the architecture of VSAN, I wanted to spend some time looking at how well it inter-operates with other vSphere products and features. vSphere Replication is a product which works quite well with VSAN. If you want to provide disaster-recovery using VSAN as a storage layer, you will need to use vSphere Replication version 5.5.1 which was released in March 2014. One thing with vSphere Replication is that it is agnostic to the underlying storage. Having said that, the consideration with using vSphere Replication with VSAN is down to the VM Storage Policies used by the virtual machines, and how these inter-operate. In my infrastructure I am replicating a VM from a traditional SAN environment to a DR site which uses VSAN storage. 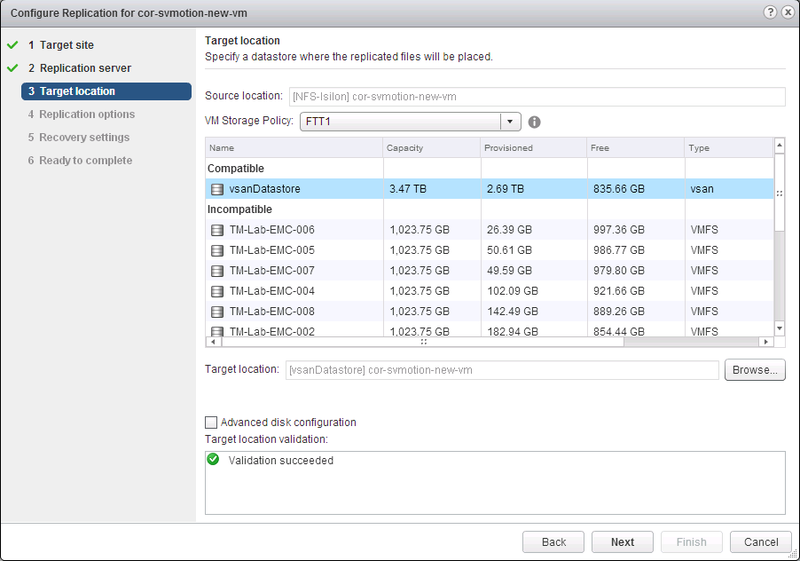 During the Configure Replication step, a VM Storage Policy from the destination environment may be chosen. Not only does this place the datastores in Compatible and Incompatible lists as shown below, but the VM Storage Policy metadata is also saved by vSphere Replication for the virtual machine that is being protected. 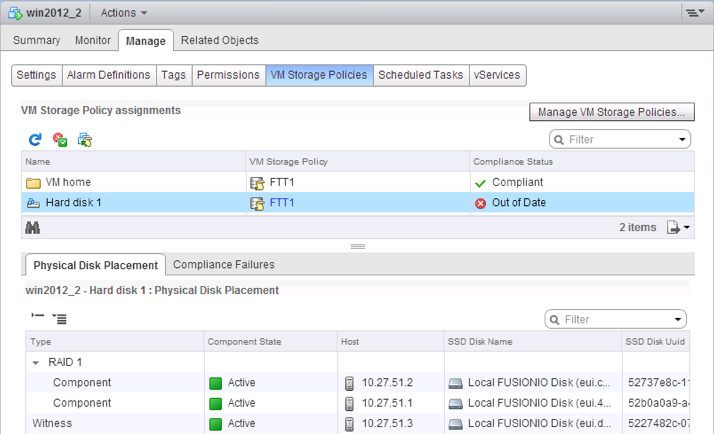 The remaining step is to click on the ‘Reapply VM Storage policy’. This will reconfigure the virtual machine with the correct VM Storage Policy. If there is considerable reconfiguration of the VM objects required, you may see the compliance status change to Not compliant. However when the reconfiguration completes, the compliance status will eventually change to Compliant. And now you have a recovered virtual machine which matches the VM Storage policy setting you chose in the original Configure Replication steps.